IFPRI’s 2016 Global Hunger Index – which measures the state of hunger at the global, regional, and national levels – is now out. 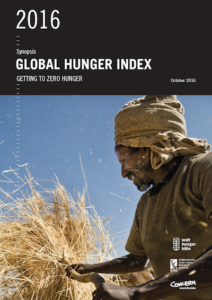 The 2016 GHI reveals that despite a 29 percent decrease in hunger scores in developing countries since 2000, the world is not on track to reach the Sustainable Development Goal of ending hunger by 2030. More than 45 countries – including India, Pakistan, Yemen, and Madagascar – will still have “moderate” to “alarming” hunger in in 2030 if current trends continue. The GHI suggests the 2030 goal is still reachable if countries address food insecurity and malnutrition, ramp up anti-poverty efforts, reform agriculture and trade, support smallholder farmers, and reduce food waste. Read the full 2016 GHI report.